According to Hinduism, life and the various species originated by the combination of planetary globes and the five manifestations of nature namely Agni (Fire), Prithvi (Earth/Land), Jal (Water), Vaayu (Air) and Akasha (Sky/Space/Ether). Bhoota (Sanskrit:भूत) in Sanskrit means compound and maha bhoota indicates a big compound. Our whole cosmic quest of the world and beyond starts from the point of panchabhuta (five elements) which then manifests in an enjoining manner to form the life force and then, later, those five elements disintegrates to ensue a celestical traverse at the Paramanu (atom) level. The concept is that every living being originates from and eventually disintegrates in to the Panchabhuta (Five Elements). All the living beings are composed of Hydrogen,Carbon, Nitrogen, Oxygen etc. All animate nature, plant and animal are composed of the elements found in the earth and in the air. The surface and deeper layers of the earth contain all of these elements, and from them all things on this planet take on living form. On chemical analysis, the human body is found to be composed of the identical elements of which plants are composed. Biochemists have found sixteen to twenty-two (or more) elements in the composition of the body. 1. Oxygen-about 65% or 90 pounds. 2. Carbon-about 18% or 36 pounds. 3. Hydrogen-about 10% or 14 pounds. 4. Nitrogen-about 3% or 31/2 pounds. 5. Calcium-about 1.5% or 33/4 pounds. 6. Phosphorus-about 1% or 1.14 ounces. 7. Potassium-about 0.35% or 3 ounces. 8. Sulphur-about 0.25% or 3/ ounces. 9. Sodium-about 0.15% or 21/2 ounces. 10. Chlorine-about 0.15% or 4 ounces. 11. Magnesium-about 0.05% or 1 1/2 ounces. 12. Iron-about 0.004% or 1/6 ounce. 13. Silicon-very minute amount, to ounce. 16. Manganese-accompanies iron in many tissues. After the death of an animal or plant the elements from its body enters the environment and becomes part of the common pool of elements in Prithvi (Earth/Land), Jal (Water), Vaayu (Air). The concept of disintegrating in to Agni (Fire) might have come from the ritual in Hinduism of burning the dead bodies. Dead plants are burnt as fuel as well. Decomposition is the natural process of dead animal or plant tissue being rotted or broken down. This process is carried out by invertebrates, fungi and bacteria. The result of decomposition is that the building blocks required for life can be recycled. Death and decomposition are an essential part of all life cycles on earth. To enable successful birth and growth of young plants and animals, older specimens must die and decompose. This limits the competition for resources and provides a fresh source of essential nutrients for new generations of life. Water also is released from plants and animals as they decompose. Decomposition begins at the moment of death, caused by two factors: autolysis, the breaking down of tissues by the body’s own internal chemicals and enzymes, and putrefaction, the breakdown of tissues by bacteria. These processes release gases that are the chief source of the unmistakably putrid odour of decaying animal tissue. Energy is transferred from the dead tissue to the bacteria in the form of food. The concept of living being disintegrating in to Agni (Fire) after death might have been symbolic indicating energy. The fifth element Akasha (Sky/Space/Ether) might have indicated the movement of air upwards towards the sky or some obscure concept of something similar to Neutrinos or elctromagnetic waves released from the tissues and moving towards the sky. JAS. JOHNSTONE. Chemical Composition of the Animal Body. Letters to Editor. 1. The Religion of the “Mankind” (and “Womankind) is “Science”. 2. The God of the “Mankind” (and “Womankind) is “Truth”. 3. The Religious Book of the “Mankind” (and “Womankind) is “All Factual Scientific Literature”. 4. The people of this Religion practise “seeking and sticking to the truth, and treating everybody (including themselves) fairly”. 5. The people of this Religion would not go to “Heaven” even if they practise it religiously, they would only live their lives “Truthfully”. 6. The people of this Religion would not go to “Hell” even if they do not practise it religiously, they would only live their lives “Untruthfully”. The Bhagvad Gita offers ample lessons in life about handling crises situations, managing people and achieving success. Here is one of the examples with its scientific explanation. Translation: Go on efficiently doing your duty at all times without attachment. Doing work without attachment man attains the supreme. Inculcate the habit of being open to everything and being attached to nothing. Attachment does give strength to work and love beyond ourselves, but it also limits us and makes our journey and growth difficult, especially if the object of our desire is taken away from us. Too much desire can be bad, as it turns into greed. Greed takes you away from your true calling and dream, be it to achieve, create or innovate. Do not be super attached to your work, as it makes your journey as an entrepreneur difficult and closed. You cannot wear binoculars and run the rat race. You have to keep an open mind about the ever-evolving market changes, adapt to them. Keep a close eye on your goals but do not get obsessive. Most of the steroid hormones and thyroxine in circulation are bound to carrier proteins, and a small fraction circulates free or unbound. This latter fraction is available for target cell entry, ie, the biologically active portion. The hormone that is attached to protein is not active and cannot perform its function. It can act only when it is free from attachment. Likewise, a person would be able to perform when he/she is free from attachment. The word “reincarnation” derives from Latin, literally meaning, “entering the flesh again”. “Reincarnation is the religious or philosophical concept that the soul or spirit, after biological death, can begin a new life in a new body. This doctrine is a central tenet of the Hindu religion. It is also a common belief of various ancient and modern religions such as Spiritism, Theosophy, and Eckankar, and is found as well in many tribal societies around the world, in places such as Siberia, West Africa, North America, and Australia. Although the majority of sects within the Abrahamic religions of Judaism,Christianity, and Islam do not believe that individuals reincarnate, particular groups within these religions do refer to reincarnation; these groups include the mainstream historical and contemporary followers of Kabbalah, the Cathars, the Druze and the Rosicrucians. The historical relations between these sects and the beliefs about reincarnation that were characteristic of Neoplatonism, Orphism, Hermeticism,Manicheanism and Gnosticism of the Roman era, as well as the Indian religions, has been the subject of recent scholarly research. “The origins of the notion of reincarnation are obscure. Discussion of the subject appears in the philosophical traditions of India (including the Indus Valley). The Greek Pre-Socratics discussed reincarnation, and the Celtic Druids are also reported to have taught a doctrine of reincarnation. “Reincarnation – known as Punarjanma – it is one of the core beliefs of Hinduism that is generally accepted by many of its practitioners. There is no permanent heaven or hell in Hinduism. After services in the afterlife, thejiva enters the karma and rebirth system, reborn as an animal, a human or a divinity. 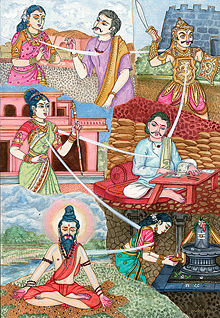 This reincarnation continues until mokṣa, the final release, is gained. According to the Hindu sage Adi Shankaracharya, the world – as we ordinarily understand it – is like a dream: fleeting and illusory. To be trapped in samsara (the cycle of birth and death) is a result of ignorance of the true nature of our existence. It is ignorance (avidya) of one’s true self that leads to ego-consciousness, grounding one in desire and a perpetual chain of reincarnation. The idea is intricately linked to action (karma), a concept first recorded in the Upanishads. Every action has a reaction and the force determines one’s next incarnation. One is reborn through desire: a person desires to be born because he or she wants to enjoy a body, which can never bring deep, lasting happiness or peace (ānanda). After many births every person becomes dissatisfied and begins to seek higher forms of happiness through spiritual experience. When, after spiritual practice (sādhanā), a person realizes that the true “self” is the immortal soul rather than the body or the ego all desires for the pleasures of the world will vanish since they will seem insipid compared to spiritual ānanda. When all desire has vanished the person will not be born again. When the cycle of rebirth thus comes to an end, a person is said to have attained liberation (moksha). All schools agree this implies the cessation of worldly desires and freedom from the cycle of birth and death, though the exact definition differs. Followers of the Advaita Vedanta school believe they will spend eternity absorbed in the perfect peace and happiness of the realization that all existence is One Brahman of which the soul is part.Dvaita schools perform worship with the goal of spending eternity in a spiritual world or heaven (loka) in the blessed company of the Supreme Being. To experience the fruits of one’s karmas: This is the main reason for rebirth. Sattvika (good or righteous) karmas reward one with the pleasures of Svarga. Rajas (pleasure-seeking) karmas reward one with mrutyuloka (mortal realm or earth). And Tamas karmas (actions related to inertia, laziness and evil) condemn one to patala-loka. To satisfy one’s desires: When a person indulges in material pleasures, he or she subsequently develops a stronger desire to enjoy more of it (Vāsanā). This unending craving to satisfy one’s desires causes the jiva to assume new physical bodies. To complete one’s unfinished sadhana: When an aspirant making spiritual efforts for liberation from maya dies without attaining his or her goal, the jiva gets as a natural cause-effect another human body to complete its sadhana. To undergo sufferings because of a great soul’s curse: A person’s grave error or sin may incur the wrath or displeasure of God or a Rishi. This results in the jiva of that person getting another birth, not necessarily into a human body. All the living beings are composed of Hydrogen,Carbon, Nitrogen, Oxygen and other elements. After the death of an animal or plant the elements from its body enters the environment and becomes part of the common pool of elements. Decomposition is the natural process of dead animal or plant tissue being rotted or broken down. This process is carried out by invertebrates, fungi and bacteria. The result of decomposition is that the building blocks required for life can be recycled. Death and decomposition are an essential part of all life cycles on earth. To enable successful birth and growth of young plants and animals, older specimens must die and decompose. Therefore, following its death the elements from an animal or plant enters the common pool then re-enters another animal or plant’s body, and subsequently the body of any newborn animal or plant. The elements could be considered as the “Atman” or “Soul” that is released from a deceased body and re-enters the body of a newborn (reincarnation). Vasudhaiva Kutumbakam (From “vasudhā”, the earth; “ēva” = indeed is; and “kutumbakam”, family;) is a Sanskrit phrase which means “the world is one family”. Eternal conflicts have been going on in the world between countries and in societies resulting from the perception of ‘foreignness’ in individuals or groups of people in relation to their country of origin, ethnicity, race, religion, sect, caste, skin colour etc. The concept of “Vasudhaiva Kutumbakam” (“the world is one family”) would be a useful tool to achieve world peace. 1. Origin and evolution: The modern Human originated from either a single source in Africa (more likely) or multi-regional sources (in Africa, Europe, Asia etc). Even if it was multi-regional origins, it would have been a single origin at some point in evolution if we go back enough in time. Therefore, all the human beings are relatives. From religious perspective if the human beings were created by God (such as Adam and Eve) everybody is a relative. 2. Genetics: All human beings have 46 chromosomes (except some with chromosomal abnormalities). Genetic variation between European, Asian and African human populations is substantially less than differences between populations of chimpanzees. In fact, there is significantly more genetic variation between two individual chimpanzees drawn from the same population than there is between two humans drawn randomly from a single population. a) Elements (carbon, nitrogen, minerals, water etc) from the secretions, excreta, shed hairs and skin cells, cut nails etc enter the natural pool of elements on earth. This also happens after the death of the human being. These elements eventually enter the food chain and a part of it would be consumed by people from different country of origin, ethnicity, race, religion, sect, caste, skin colour etc. What is the point of thinking differently regarding people who are apparently “different” when you are consuming elements coming from their bodies and those elements being incorporated in to your own body? b) Air expelled from one’s body in to the atmosphere travels all over the world and enters others’ body. There is no way people can avoid breathing in air expelled from other people of “different” background including that from the animals! 4. Blood transfusion, organ donations etc: The source could be people perceived to be “different”. 5. Use of goods: People use goods and consume foods made by people perceived to be “different”. Conclusion: There is no logic in people behaving differently with people perceived to be “different”. Consider everybody as a part of one family that would stop the conflicts in the society and the world, leading to peace. If people cannot consider that then they should at least consider to stop breathing in air contaminated by those people perceived to be “different”! Would you or could you?